HR: Dayton: Jonathan India (2nd, 0 on base in first inning); Reshard Munroe (3rd, 2 on base in seventh inning). 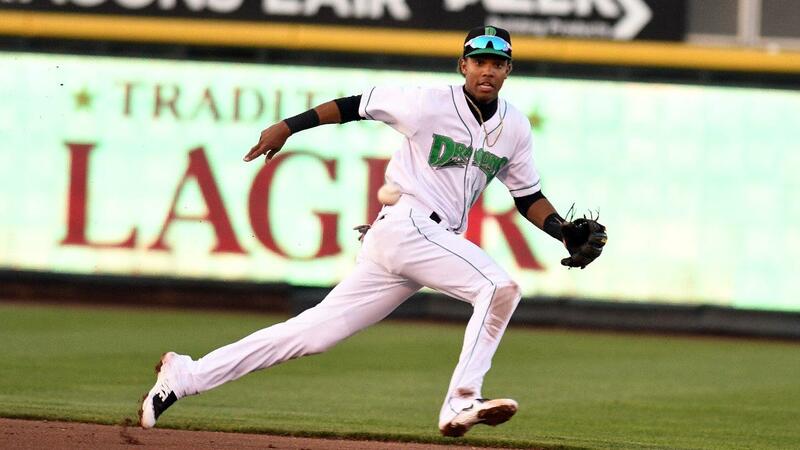 Bowling Green, Ky.-Dayton's Reshard Munroe hit a game-tying three-run and added a ninth inning tie-breaking sacrifice fly as the Dragons defeated the Bowling Green Hot Rods 7-6 on Saturday night. The game was the start of a season-ending three-game series. The Dragons had to work out of a tough jam in the bottom of the ninth to hold a 7-6 lead. Bowling Green's first two runners reached base before Dayton pitcher John Ghyzel recorded the first out by making a diving catch of a bunt attempt. The next batter, Moises Gomez, blasted a long drive to left-center field that was caught on the warning track by Munroe, the center fielder. Andy Cox replaced Ghyzel and got a routine fly out to left field to end the game. Dayton's Jonathan India opened the game with a home run to left field, but the Dragons trailed 4-1 in the seventh. Munroe belted an opposite field two-out home run to tie the game at 4-4. The Dragons briefly took the lead in the eighth as Jose Garcia delivered a run-scoring double and Andy Sugilio added a sacrifice fly, but Bowling Green tied the game with two in the bottom of the eighth. In the top of the ninth, Dayton's Alejo Lopez reached on a two-base error to start the inning, went to third on a wild pitch, and scored on Munroe's sacrifice fly to give the Dragons a 7-6 lead. Dayton starting pitcher Jarod Solomon lasted two and two-thirds innings, allowing three runs on three hits with four walks and one strikeout. Connor Bennett replaced Solomon and worked three and one-third innings, allowing one run on five hits with one walk and four strikeouts. Ghyzel entered the game to start the seventh and worked two and two-thirds innings, allowing two runs on three hits with three walks and one strikeout. He earned the win to improve to 3-7. Cox retired the only batter he faced for his first save. The Dragons finished the night with nine hits. Garcia's double extended his hitting streak to 16 straight games. Sugilio had two hits and an RBI. Up Next: The Dragons (27-41, 58-78) meet the Hot Rods (41-27, 88-49) on Sunday night at 7:35 (EDT) in the second game of a season-ending three-game series. Packy Naughton (5-10, 4.17) will start for Dayton against Resly Linares (7-3, 3.21).